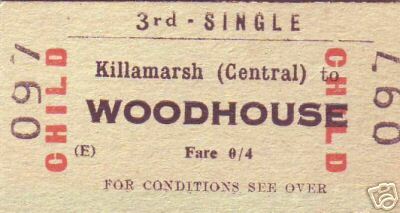 As indicated on the Railway Map of 1915, there was once a railway station in Killamarsh (next to the Midland pub). 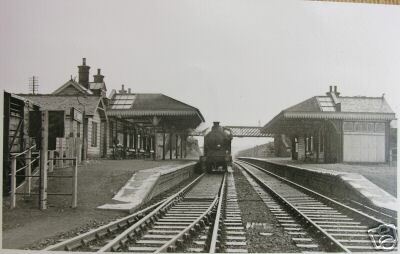 The pictures below show the railway station in about 1950 (at a guess, steam trains went out in the 1960s). The map actually indicates that in 1915 there were actually two stations, one Great Central, and one the Midland Railways. Presumably the Midland pub was named after the Midland line's station. The lower picture is of the remains of the railway line in 2005, it was presumably closed as part of the Beeching cuts of the 1960s. The route of the line is now part of the Transpennine Trail. You may remember that some time ago I sent you some pictures of the floods in 1932 which I note are still on the website. When I was very young, up to my dad being called up in 1941, and occasionally after when he was on leave, our Sunday morning walk was most often down to Station Road, up past the station and on to the Chesterfield Canal towpath. From here we had a vantage point for viewing the trains (not many on Sundays) but I seem to remember that there was a regular "express" passenger train at around 10.30 on the line travelling towards the north - presumably Sheffield and I have a very fuzzy photo of one such train - but I cannot make out anything from it, except that it was probably a 4-4-0 engine (referred to as an Atlantic type, I think). That was one highlight of the walk. About 1/4 mile after joining the canal towpath at the top of Station Road, there were two bridges - one over the canal and one over the railway - these were on a public footpath between Killamarsh and Eckington. I remember that the bridge over the canal was referred to as "Cat Gallus" (at least that was what it sounded like). I don't know what the actual name was but I wondered if it was a contraction of Cat Gallows.If so why did it have this name? I wondered if during your devling into the history of the area you had come across this name and its origin? Can any resident of Killamarsh can answer John's question?